* About us: Crafted Serenity has run since March 1st 2016, with a great track record of grief prevention, customer service, reliability and uptime. We are incredibly community based; the greatest attraction of the server is the friends you will make. We offer a main survival map, with plugins to ensure that our players are able to build without the presence of griefers. We have many addons such as MCMMO, Jobs, Towny, Grief Prevention, ChestShops, Quests, Lottery, And Other Fun Events! 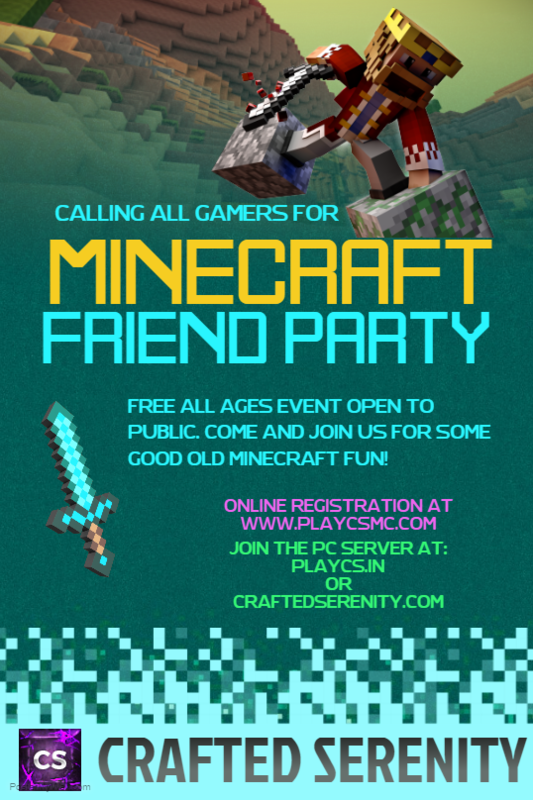 Crafted Serenity Survival Server is one of the best community based server where you are welcome to share your stories here with others to those who are willing to listen. Very happy and open community which allows successful stress relief and a "way out" of reality for a period of time. CS staff are dedicated to support all players and how they are truly feeling a very unique experience and allows you to truly feel free to creating your own Minecraft world and relieve all that stress from school, work or anything else! * Rules: Please handle yourself as a responsible player handling your interactions with others both on the server and in the community at large. Pestering people for powers is quite perturbing and patently preposterous, please. Easiest way to get banned is to pour lava on someone's house. This is not a pvp server. All actions are logged. Do not steal, destroy, or otherwise grief. * Mods: We have a team of mods to help new players get situated and with powers to help anyone who has been griefed. However their powers don’t allow for upsetting the survival balance i.e. Item spawning, free teleportation, etc.